Our high quality salmon roe will provide an exciting flair to your dishes. Each and every bite is filled with crisp, fresh bursts of flavor. Slightly briny with a sweet ocean liquor taste, salmon roe make a perfect compliment to endless dishes. These little eggs are brimming with vitamins and omega-3 fatty acids and are harvested from Pacific Salmon in an environmentally friendly process. Salmon roe is one of those unique foods that the tongue craves long after the last taste. Each egg provides a smooth and light texture that combines excellently with the slightly salty flavor. They make a beautiful topping for sushi but also pair well with eggs, fish, and other seafood for an array of lovely menu choices for your diners. Known as ikura in Japan, salmon roe also make an amazingly simple and delicious meal atop white rice or wrapped in seaweed. When our salmon roe is harvested from wild Alaskan salmon, the rest of the fish can be processed while the roe is prepared for sale. This non-wasteful process ensures that as much of the salmon as possible is used for delectable seafood dishes. Pacific Alaskan salmon are among the most thoroughly managed species in the world. The populations are monitored vigorously and effective fisheries management regulations are strictly held in place. 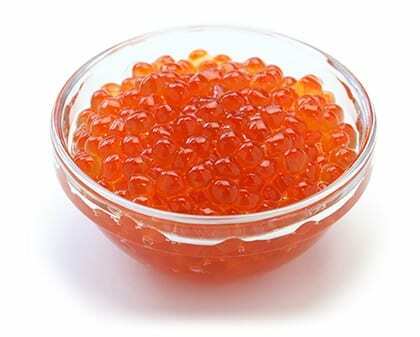 Indulge your clients with high quality salmon roe from Pucci Foods. With excellent health benefits and a sustainable source, salmon roe makes an intelligent (and delicious) choice that is healthy for our bodies and our oceans. Buy your wholesale salmon roe from Pucci Foods by filling out the form on this page and a member our team will be in touch soon.